Car of the Year | COTY - common abbreviation for numerous awards. The "Car of the Year" phrase is considered to have been introduced by Motor Trend magazine in 1949 when the new publication named Cadillac as Motor Trend Car of the Year. Other publications and various organizations also have COTY recognitions. These may focus on regional markets, vehicle types, or market segments. CONCORSO D'ELEGANZA VILLA D'ESTE - since 1929. "The most significant of all events celebrating the mystique of Historic Cars." International CAR of the YEAR AWARDS | ICOTY - since 1997. Presented by the United States magazine Road & Travel Magazine. This Ferrari GTO is the most valuable car ever auctioned. It sold for US$48 million - "A 1962 Ferrari 250 GTO sold for US$48.4 million at RM Sotheby's annual Monterey collector car sale - a world record for any car ever sold at auction." WITH ITS NEW 911, PORSCHE IMPROVES THE UNIMPROVABLE - AGAIN - Wired. WORLD CAR OF THE YEAR AWARDS - "The World Car Awards (WCA) is a program initiated by, organized by, and conducted by automotive journalists from all over the world. From the outset in 2004, those of us involved in making it a reality have done so in the context of one over-riding priority. We are dedicated to ensuring that it is carried out with the utmost objectivity, credibility, and integrity." BUGATTI LA VOITURE NOIRE - (2019). "Reminiscence of an Icon." A pioneering spirit, passion for perfection and the desire to continually redefine its limits have been the key characteristics of BUGATTI since it was founded 110 years ago. None of the brand’s masterpieces reflect these values more impressively than the Type 57 SC Atlantic. Bugatti DIVO - (2019-). "Happiness isnt't just around the corner. It is the corner." The DIVO is the most agile and dynamic car BUGATTI has ever created - a perfect homage for the 110th anniversary, which will be held in 2019. A monumental driving machine, production will be strictly limited to just 40 units. 2019 Ford Mustang Bullitt - "Like the 1968 original, this special-edition Mustang delivers tire-smoking performance and stop-you-in-your-tracks, smoking-hot looks. With high-performance components, unique BULLITT design features and some must-have options, this Mustang will blow you away." Modeled after the 1968 Ford Mustang 390 GT fastback driven by McQueen’s character, Frank Bullitt, the 2019 Ford Mustang Bullitt edition builds on the content of the Mustang GT Premium. 2019 Jaguar I-PACE - "Our First All-Electric Car." Introducing the Jaguar I-PACE, our first all-electric SUV. See the evolution of the art of performance, with refined sports precision and a stunning design. Aston Martin DB11 Volante - (2018). Completes the family; offering an equally stunning, open-topped GT experience. Surface lines emanating from nose to tail in both the Coupe and Volante. 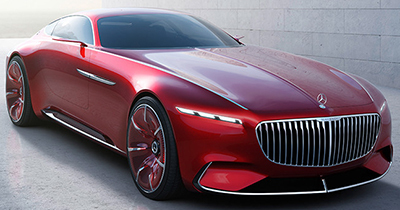 Vision Mercedes-Maybach Ultimate Luxury - "Exclusive motoring at the highest level." Even includes an internal tea service console & tea service. Mercedes CLS - (2018). "Third Generation of the Original." 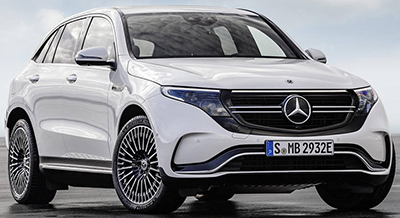 The new Mercedes-Benz CLS (C 257) 2018 pioneers the new design idiom of Mercedes-Benz, which is recognisable by its clear contours and reduced lines. BUGATTI CHIRON SPORT - (2018). "The Ultimate Super Sports Car.Redefined." The CHIRON SPORT is BUGATTI’s breathtaking new interpretation of the ultimate super sports car, unveiled at the 2018 Geneva International Motor Show. A firmer chassis setting combined with lightweight components provide even sharper handling and exhilarating agility - without compromising the CHIRON’s uniquely luxurious character. 2019 Ford Mustang Bullitt - "Modeled after the 1968 Ford Mustang 390 GT fastback driven by McQueen’s character, Frank Bullitt, the 2019 Ford Mustang Bullitt edition builds on the content of the Mustang GT Premium." 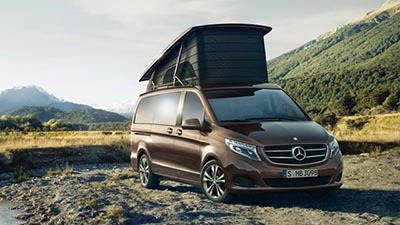 Mercedes-Benz V-class Marco Polo - "Pack up and go." Embrace spontaneity with the V-Class Marco Polo. Stylish, sporty and practical, it’s the perfect companion for big days out, overnight stays and weekends away. Bentley New Continental GT - (2018-). "The world of grand touring has changed." With a completely new 6.0 litre, twin-turbocharged W12 engine, a step-change in technology and a truly stunning design language, the new Continental GT is unmatched in its class. This Bentley GT coupé is the quintessential grand tourer - phenomenally powerful, beautifully designed and exquisitely crafted. Aston Martin Vantage - (2018-) "A Born Predator." Race track, winding country road or the everyday commute, Vantage is an Aston Martin of outstanding class, delivering a drive so intensely felt that it demands to be experienced time and time again. Mercedes-AMG GT R - (2017-) "The Beast of the Green Hell." Developed on the racetrack. Built for the street. The advanced technology of the Mercedes-AMG GT R delivers the ultimate driving experience such that it conveys the experience of our motorsport origins in every fiber and ushers in a new era. 2018 Rolls-Royce Phantom VIII - "The world needs icons." Ferrari Portofino - "A GT that represent a unique combination of sportiness, elegance and on board comfort." TESLA MODEL 3 - "Production is scheduled to begin in mid 2017. At this time, the delivery estimate for new reservations is mid 2018 or later, depending on country of delivery." BMW Concept 8 Series - "Return to a new era." It combines the agility of a sports car with the style of a gentleman. Jaguar F-Pace - (2016-). "The first Jaguar luxury performance SUV brings together sporty handling and dramatic beauty with everyday practicality and efficiency." PGO Cevennes - "Reconstructed Past and Embraced Modernity." Bentley EXP12 Speed 6e Concept - Electric Sports Car. Bentley Continental Supersports - (2017-). The upcoming Continental Supersports will be the most powerful Bentley ever, and at at a maximum of 209 mph—0 to 60 mph in 3.4 seconds - the fastest four-seat car on the planet. MERCEDES-MAYBACH S 650 Convertible - (2017-). Limited edition of 300. "The Ultimate Luxury Convertible." It comes with a 621-hp V12 engine and Swarovski crystals embedded in the headlights. 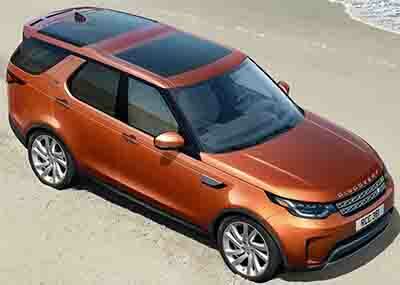 LAND ROVER DISCOVERY - (2017-). The new Lamborghini SUV. Range Rover Evoque Convertible SUV - (2016-). 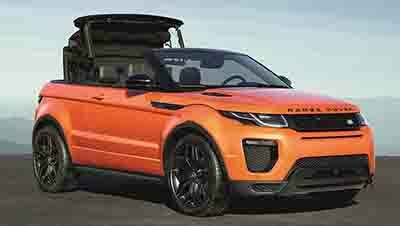 "With cutting edge engineering, the Range Rover Evoque Convertible is a SUV for all-seasons." LAMBORGHINI Centario - (2016-). Only 20 coupé and 20 roadster versions of the Centenario will be produced and all 40 cars are already sold, at a start price of 1.75 million euros plus tax. BRISTOL BULLET - (2016). "Bristol Cars is excited to unveil the first new Bristol car since 2003 in the shape of an all-new 70th Anniversary model - the Bristol BULLET." ASTON MARTIN AM-RB 001 - "The £2.5m Aston Martin that's faster than a Formula One car." Mercedes-AMG GT R - (2018). "The nastiest version of the AMG GT to date." BENTLEY MULSANNE EXTENDED WHEELBASE - (2016-). "Explore the new pinnacle of Bentley luxury." Porsche 718 Boxster S - "For the sport of it." (2016-) From MSRP US$ 68,400.00. ASTON MARTIN Vantage GT8 - (2016-). 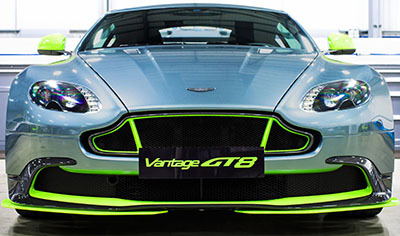 "Taking the V8 Vantage to dynamic new extremes." Road-legal race car. MCLAREN 570GT - (2017-). "For the Journey." Acura NSX - "The thinking man's supercar." BMW 750i xDrive - (2016-). 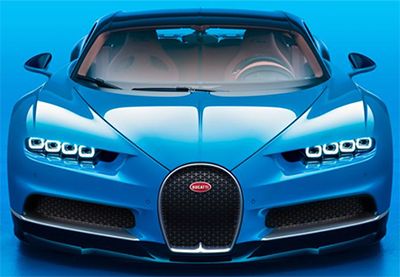 BUGATTI CHIRON - (2016). 'We have made the best even better.' The beastly, faster-than-fast, 1,500hp Veyron successor. ASTON MARTIN DB11 - (2016-). Gumpert Arrow - (2016-). The 986bhp (1000hp) & 224mph Arrow hypercar. Ferrari GTC4Lusso - (2017-). "A whole new world." PORSCHE 911 TURBO S - (2017-). "The new 911 Turbo S."
Lamborghini HuracÁn LP 580-2 - (2016-). Rolls-Royce Dawn - (2015-). "A Rolls-Royce like no other." Force 1 V10 - (2016-). VLF Automotive. 745-HP 8.4 L V10 engine. Price: US$268,000. FERRARI 488 GTB - (2015-). FFZERO1 - "Glimpse Into the Future." Internet-connected 1,000-horsepower FFZero1 incorporates several ambitious elements including: the ability to top 200mph (321 kph) and accelerate from zero to 60mph in less than three seconds; a helmet that provides oxygen and water to the driver; "aero tunnels" that channel air through the vehicle to reduce drag and cool the batteries; a multi-touch screen interface and augmented reality views projected onto the road ahead. W Motors Fenyr Supersport - 900 hp. Price: US$3.4 million. Ferrari F12tdf - (2015-). Just 799 will be built. KOENIGSEGG CCXR Trevita - limited to just three examples. Price: US$4.85 million. Aston Martin DBX Concept - (2015-). All-electric GT crossover. Aston Martin's answer to Tesla's Model X.
MERCEDES-BENZ AMG GT S - (2016). Bentley EXP 10 Speed 6 Concept - (2015). First look at our British interpretation of a pinnacle luxury, high performance two-seater sports car. 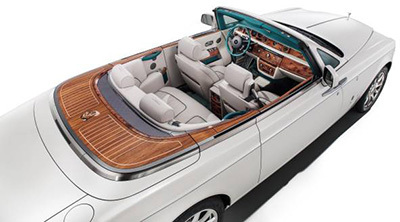 ROLLS-ROYCE Maharaja PHANTOM Drophead COUPÉ - (2014). One-of-a-kind Bespoke vehicle created exclusively for customers in Dubai. 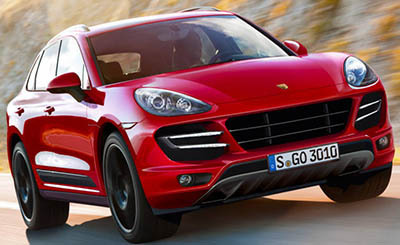 PORSCHE Macan S - (2014-). "Life, intensified." 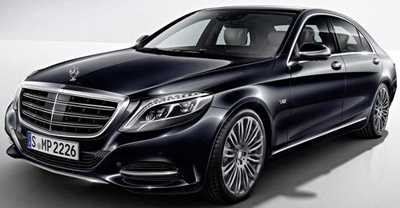 Mercedes-Maybach S600 - "Unprecedented exclusivity. Unlimited luxury." (2015-). FORD MUSTANG Rocket - (2015). "The ultimate American muscle car." 725-horsepower carbon-fiber Ford Mustang based off the latest 2015 Mustang. 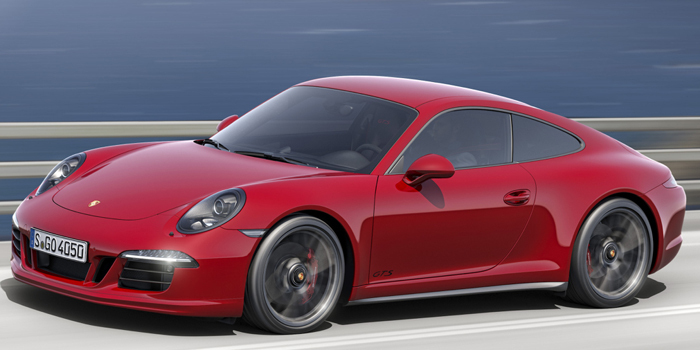 PORSCHE 911 CARRERA GTS - "All that matters." (2015-). Mercedes-Benz Mercedes-AMG GT - (2014-) "The World's Next Great Sports Car". Jaguar Lightweight E-type - Jaguar Land Rover has unveiled the first of six reborn Lightweight E-types, which will go on sale for an estimated £1 million apiece following their debut at the Pebble Beach concours event in California on August 14. Rimac Concept One - two-seat high-performance electric sports car. 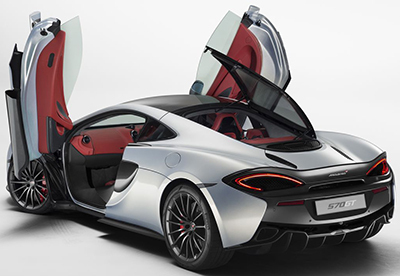 Described as the world's first electric supercar and the world's fastest accelerating electric automobile as of 2013. Top speed: 305 kph. Range: 600 km. Price: US$980,000. Bentley Birkin Mulsanne Limited Edition - just 22 cars is available in three colour specifications: Ghost White, Damson, and a contrast of Fountain Blue and Dark Sapphire. DELAHAYE - (1895-1954). Delahayes of the 30s are recognized to be some of the most beautiful automobiles ever built. 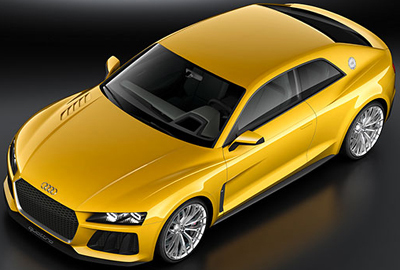 Audi Sport Quattro - (2013-). Plug-in hybrid. Total power is rated just shy of 700bhp. Also be one of the fastest, with a claimed 3.7sec 0-62 time and a 189mph top speed. CO2 emissions come in at a claimed 59g/km, fuel economy is rated at a staggering 113mpg while in electric only EV mode, the car will cover 31 miles. FERRARI 250 GTO - GRAN TURISMO OMOLOGATO - (1962-1964). In October 2013 the 1962 Ferrari 250 GTO made for Stirling Moss became the world's most expensive car, selling in a private transaction for $52 million. 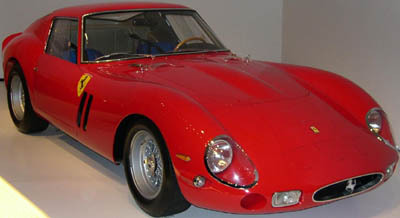 The red competition car, formerly owned by the Greenwich, Connecticut-based collector Paul Pappalardo, was acquired by an unidentified buyer in a private transaction. Aston Martin CC100 - (2013). Concept car produced by the British car company Aston Martin to celebrate its 100th anniversary. 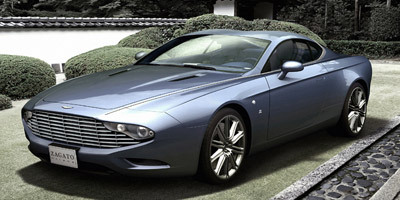 Aston Martin DBS Coupé Zagato Centennial - (2013-). Jaguar XJ Ultimate - "The most beautiful limousine in Jaguar’s history." The definitive luxury car. Aston Martin Vanquish - (2012-). "The Ultimate Grand Tourer." 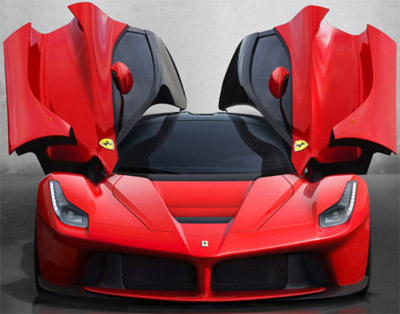 LAFERRARI - (2013). The successor to the Enzo Ferrari. 6.3-liter V12 engine with 789 horsepower married to a 160-hp electric motor. 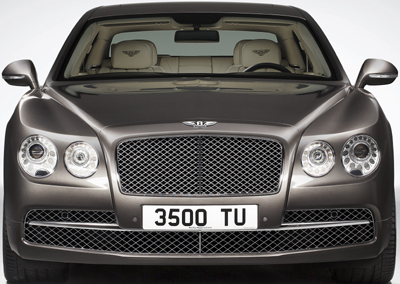 BENTLEY NEW FLYING SPUR - (2013-). Luxury sedan. LAMBORGHINI Veneno - (2013-). Most powerful, most expensive Lamborghini ever! 750-horsepower. Price: US$4.6 million. 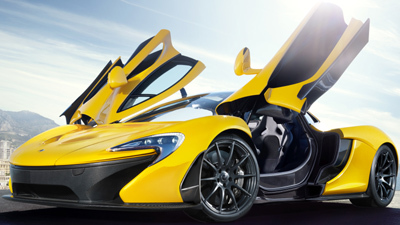 MCLAREN P1 - (2013-). Hybrid supercar. 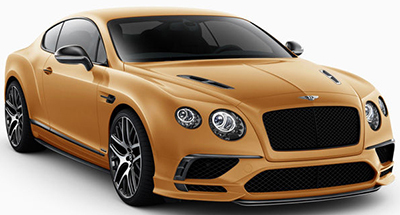 BENTLEY CONTINENTAL GT SPEED - the fastest, most powerful two-door coupé that Bentley makes. Ferrari F12 Berlinetta - (2012-). Winner of "2012 Auto Bild Design Award". Replaces the Ferrari 599 series grand tourers. BUGATTI VEYRON 16.4 GRAND SPORT VITESSE - 2013. The most powerful roadster of all time: 1200 hp, 258 mph, 410 km/h, accelerates in 2,6 sec (0-100km/h). Only 150 units will be produced. On YouTube. LAMBORGHINI AVENTADOR J - limited edition. LAMBORGHINI GALLARDO LP 570-4 SUPER Trofeo Stradale - "The most extreme Gallardo ever." JAGUAR C-X16 - "A Concept 'One Plus One' Sports Car." FERRARI 458 SPIDER - V8 mid-rear engine with retractable hardtop. LEXUS LFA 2012 - "A New Breed of Lexus." Limited edition: 500 cars. PEUGEOT EX1 - film presentation: 100% electric record-breaking concept car. PORSCHE 918 SPYDER - "Porsche Intelligent Performance. The Next Spark." Porsche hybrid technology for the sports car of the 21st century. GROWLER E 2011 CONCEPT - Jaguar E-Type reborn. Jaguar E-Type celebrates its 50th anniversary in 2011. 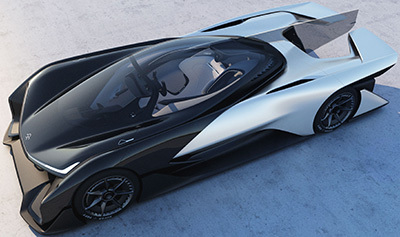 Anonymous Swiss businessman commissioned Bo Zolland from Swedish design studio Vizualtech and independent Swiss designer Robert Palm to develop an exceptional sports car inspired by the original legend. Plans are to have the first Growler ready for delivery in the summer of 2012. FERRARI FF - 12 cylinders. 4 seats. 4 wheel drive. PORSCHE 911 BLACK EDITION - limited edition of 1,911 cars. 2011 MERCEDES-BENZ CLS63 AMG - four-door coupé. XENATEC - special purpose vehicles. BENTLEY CONTINENTAL SUPERSPORTS CONVERTIBLE - the fastest, most powerful Bentley ever with the new flexfuel technology. ASTON MARTIN RAPIDE - the world's most elegant four-door sports car. RANGE ROVER EVOGUE - the smallest, lightest and most fuel efficient Range Rover to date. PORSCHE 911 GT2 RS - "Porsche Intelligent Performance." 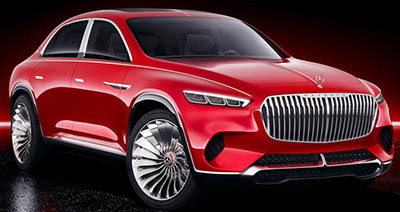 MAYBACH 62 S - "Excellence in Luxury." CITROËN METROPLOLIS - plug-in hybrid-limousine concept. AUDI A8 L W12 QUATTRO - "The art of progress." FERRARI 599 GTO - V12 berlinetta. Limited edition of just 599 cars. PORSCHE 918 SPYDER - "Porsche Intelligent Performance." OVER P001 GBF - motto of this platinum dream car: "The Future is Over". 2010 CADILLAC ESCALADE HYBRID - fuel efficient SUV. AUDI A8 - "The art of progress." KARMA - the world’s first eco-chic cars created in equally eco-friendly facilities. BENTLEY CONTINENTAL SUPERSPORTS - the fastest, most powerful Bentley ever with the new flexfuel technology. LEXUS LFA - limited edition: 500 cars. PORSCHE 911 SPORT CLASSIC - limited edition: 250 cars. PORSCHE 111 GT3 RS - Porsche's newest. ASTON MARTIN ONE-77- limited edition: 77 cars. BUGATTI VEYRON ROADSTER 16.4 GRAND SPORT - world's fastest sports car. MANTIDE - world's most expensive supercar. MCLAREN F1 ROAD CAR - only 64 ever made. MERCEDES-BENZ SLR STIRLING MOSS - limited edition: 75 cars. NLV QUANT - super electric car!